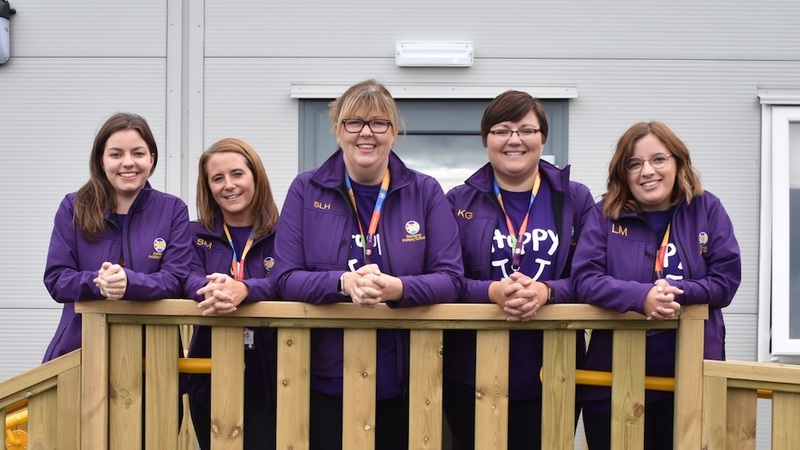 It was the first day of school in more ways than one as South Leeds newest primary school opened its doors last Monday (10 September 2018). The staff at Elements Primary School in Middleton. Elements Primary School in Middleton welcomed 22 children to its Reception Class and two of the three teachers waiting to greet them were also starting their school careers. As South Leeds Life has previously reported, Elements is taking fresh approach to primary education. Amongst other innovations it will employ extra teachers rather than support staff. Someone else on their first day was Mollie the school dog. Mollie, an eight year old chocolate Labrador, seemed to be making herself at home and making lots of new friends. The school is currently housed in two (very high quality) temporary buildings on Acre Mount, but within 12 months a new two form entry primary school will be built on another part of the large site. The school aims to make the most of information technology and parents have been kept informed by email, which has been received positively. Having worked hard to get the building ready for the children, the staff turned their attention to the parents and made welcome packs including a card, tea bags and biscuits, but perhaps most importantly on such an emotional day, tissues. The school still has places available this term. Contact the school on (0113) 532 7089.